Peruse through a few images of steampunk dress and gadgetry, and the gun will make its appearance soon enough. Fitted into holsters, held haughtily over the shoulder, brandished in threat, tucked between bustles or even adapted to retro-futurist cybernetics, the gun has become a staple of the genre in both literature, film and cosplay. Given the era that steampunk attempts to navigate, recreate and/or re-imagine, the gun only seems fitting. But like so much else from our collective past, it comes with its own troubled histories. This was also an era of racialized subjugation, colonialism and imperialism. And the gun played a central role. Weapons have long been a staple of speculative fiction–from swords and axes needed to slash Orcs, Bugbears and other convenient mooks in fantasy, or, the ray guns and phasers needed to dispense the mooks of far-flung futures. And of course, in the rather near zombie-filled apocalypse, a combination of all such arsenals will be required post-haste! Yet steampunk’s weapon of choice stands out. (1) It gives primacy and special affection to a technology with which we are all commonly acquainted–the gun. Rather rare that you hear of a triple homicide in our day and age caused by someone wielding a spiked mace. And I have yet to see death meted out on the field of modern battle by a particle beam. Guns however we all know; they adorn our popular culture television and movies, our recent histories and our mundane lives. They are “real” things, even if we adorn them with pseudo-Victorian clockwork gadgetry and nice brass piping to match our goggles, lacy corsets, and other things pilfered from the local haberdashery. Guns and gunpowder weren’t invented in the West. The earliest accounts place them in China and Muslim Eurasian Empires like the Ottomans. But by the mid 19th century guns had gone through several radical developments, the greatest coming about with the weapons revolution of the new Industrial Age. The 1830s to the early 1860s saw the development of the percussion cap, the conical bullet, the revolver and the riled musket. Breech-loading weapons soon followed, taking prominence with the invention of the brass cartridge. 1861 brought the Gatling gun, one of a few quick-firing weapons in manufacture. But it was soon outdone by the American-born British inventor Hiram Maxim in 1884, whose new automatic weapon would become the world’s greatest “killing machine” and the most useful arsenal in colonization. It began in part with that most steampunk-ish of events, an expedition. In 1885, the Anglo-Egyptian governor of Equatoria on the Upper Nile, Eduard Schnitzer, adopting the name Emin Pasha, was in dire trouble. Four years earlier in the British-Egyptian ruled province of Sudan, carved out in part from the crumbling Ottoman Empire, a Sudanese religious leader of the Samaniyya sect, Muhammad Ahmad bin Abd Allah, had declared himself the Mahdi–the messiah and redeemer of Sufist Islam who would drive out the foreign Anglo-Christian invaders. With Britain engaged elsewhere, he had been quite successful in his rebellion, creating an Islamic state and effectively cutting off all contact from Anglo-Equatoria, which was held by Emin with little more than a few thousand soldiers. When the revolt captured Khartoum in 1885, Emin realized no help would be coming from the now collapsed Anglo-Egyptian administration and withdrew even further south–with the Mahdists on his heels. In late 1886 a group of British adventurists took it upon themselves to rescue the threatened Equatoria by organizing the Emin Pasha Relief Expedition. The group consisted of military veterans, explorers and would be imperialists–who all saw in Africa the need and duty to carry out the “civilizing mission” against Mahdists, Eastern slavery and those cultures outside of Western modernity. They were backed by the philanthropist and colonialist William Mackinnon, and led by Henry Morton Stanley who was previously engaged in helping carve out the infamous Congo Free State for King Leopold II of Belgium–which by the early 20th century would result in some 3 to 10 million excess Congolese deaths through brutal labor regimes and starvation. The Scramble for Africa, unleashed by the Berlin Conference in 1884-85, was underway. The express purpose of the expedition according to Stanley was “non-military…not to fight, destroy, or waste” but “to save, to relieve distress, to carry comfort.” Yet nothing highlights the imperial mission of the age more than when Hiram Maxim presented the expedition with one of his new Maxim guns. It was the world’s first fully automatic machine gun, capable of firing six hundred rounds in a single minute, and the first of its kind brought to Africa. Maxim later made it plain that he had invented the weapon with the express purpose of killing men, in particular for “stopping the mad rush of savages” who the white world was set to conquer. Albert Edward Prince of Wales, after seeing its fearsome exhibition, would hail it, Maxim’s “little daisy of a gun. 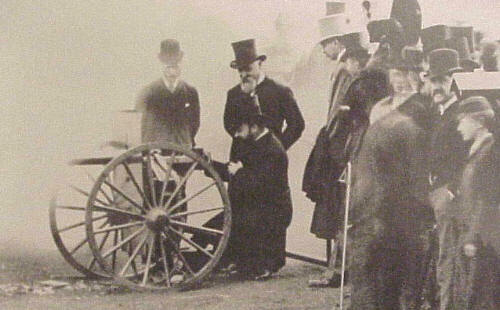 The Prince of Wales (later Edward VII), tries out Maxim’s gun, August 1888. Its usage on the expedition was meant to be one of psychological warfare upon the region’s “natives,” who it was thought would cower at the mere exhibition of the Maxim’s lethal firepower. The three-year mission itself was somewhat of a disaster, hampered by dense forests and other maladies that took several lives. In the end they managed to return with Emin, and relate exotic tales of “darkest Africa” to a fascinated European public. And the Maxim? It was put to use by the expedition several times, used to induce terror among any hostile African forces. Three years later it was officially adopted by the British War Office, and would return to Africa with devastating effect. 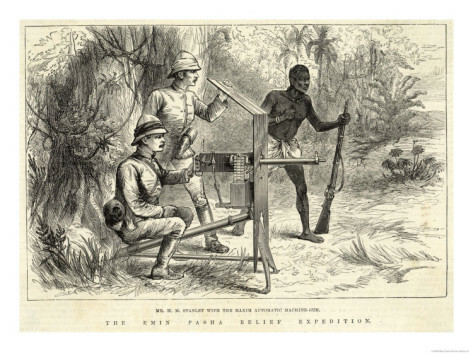 In 1890s Central Africa, Frederick Lugard would use Hiram’s Maxim gun to carve out a colonial holding for the British East Africa Company over what is now present-day Uganda. Like Stanley’s expedition, the Maxim was used to create psychological terror and to put down any resistance with lethal brutality. Staunch colonialist Cecil Rhodes also saw the importance of the Maxim as central to Britain’s colonial ventures. In the first Matabele War, a few hundred British soldiers used four Maxims to fight off an African force of 3,000. And Britain was not alone, as other European nations adopted the machine gun and put it to use in their colonial wars of conquest. A German force in 1891 with two machine guns slaughtered some 1,000 African ethnic HeHe who had put up a stiff resistance. With the machine gun, they continued to conquer into East and Southwest Africa. Buoyed in part by such victories, in 1898 the British turned their attention back to Sudan, ready to reclaim it from Mahdists. On a field north of the village of Omdurman, the British met the Sudanese forces in a decisive battle. The British forces numbered some 25,000 (8,000 British regulars, and 17,000 Egyptian and Sudanese), while the Mahdists force was in excess of 50,000. But while the Mahdists had a substantial cavalry, and older rifles, the British had modernized their army to fight in well-disciplined lines. Most important, the British were equipped with artillery, new breech-loading rifles and 20 Maxims. As the larger Sudanese force engaged the British lines, they were met with the full power of Maxim’s “daisy of a gun.” Some 20,000 Sudanese fighters and cavalry men were mowed down in the battle, carrying out what became hopeless charges against a spray of bullets. The Battle of Omdurman broke the back of the Mahdist insurgency, and showed the world the effectiveness of the Maxim in battle. And the story was repeated throughout Africa–from the British defeat of the Aro Confederacy in what is present-day Nigeria in 1901-02, to the crushing of the Ashanti resistance in what is now Ghana. The Maxim was so effective and devastating, that Cecil Rhodes once merely demonstrated its firepower to a local African leader, declaring in open threat: “This is what will happen to you and your [people], if you give us any further trouble.” The continued victories of the new weapon against overwhelming forces solidified in the British Imperial mind not only the righteousness of the colonial cause, but the superiority of white civilization itself. By the time Rudyard Kipling wrote The White Man’s Burden in 1899, extolling the United States to emulate Britain’s “civilizing mission,” the machine gun’s role in imperial conquest and the subjugation of Africa had been firmly established. 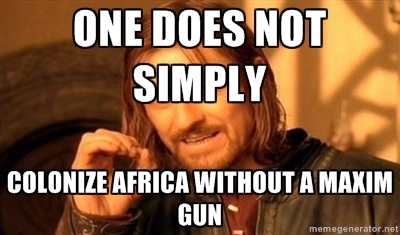 The gun would prove pivotal elsewhere European colonization took hold. It was there at the Boxer Rebellion. And used to pacify parts of Northern India. The wondrous new gun was hailed as near divine providence for the West, to help civilize in Kipling’s words “new-caught, sullen peoples” of far off lands, described as dangerous, savage beings–“Half-devil and half-child”–who only such fearsome weapons could properly subdue. The Maxim had a psychological impact upon Africans as well, who before this time had at least been able to match European weaponry with acquired rifles of their own or manufactured steel–which had prevented the continent from the fate of the Americas four centuries prior. A Matabele witness of the age would write bitterly of the white conquerors and their “guns that spat bullets as the heavens sometimes spit hail.” In a lament, he asks, “and who were the naked Matabele to stand up against these guns?” In the battle for control of Hausaland in what is present day Northern Nigeria, a Fulani in 1903 recounted hearing the first “bap-bap-bap” of machine gun fire, and then realizing in shock that “many hundreds” lay dead. On several occasions, Africans tried to get a hold of the new weapon–managing to capture a few from European garrisons. But in each case, they were either of little use or unable to be deployed. And realizing the psychological edge such a devastating weapon had on demoralizing resistance and enshrining racial supremacy, European colonizers kept a firm grip on its use in Africa as well–in many cases not even allowing its operation by conscripted locals. This was a white man’s weapon, for a white man’s conquest. With Maxims up to date. Imply the white man’s gain. By the early 20th century, the Maxim had moved beyond a tool of colonial conquest, as every major western army in the world now equipped itself with the automatic machine gun–churned out by licensed factories in Europe and the United States. With the outbreak of WWI, the machine gun was once again used by the colonial powers–only this time upon each other. Probably more than any other weapon of the war, it would make the European western front one of the deadliest battlefields in human history. Perhaps for Africa that moment came earlier in 1896, as Ethiopia faced off against Italy at the Battle of Adowa. Ethiopia was a long standing kingdom, who had not gone through modernization and still mirrored a type of feudal fiscal-military state. Italy in contrast was a newly formed nation, eager to show it could hold its own with other modern European powers. Setting their sights on Ethiopia as a colonial holding, they attempted to take the kingdom as part of an overall conquest of the Horn of Africa. However, things did not go as planned. 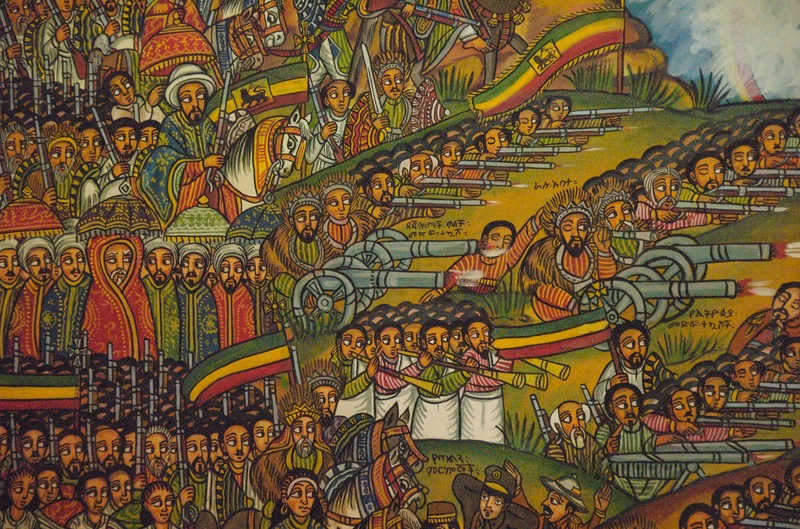 While not industrialized, Ethiopia had seen the power of the gun–particularly the Maxim–in use throughout the continent and in Asia. The kingdom hastily modernized its army, and purchased guns–including Maxim pieces–from Anglo-Egypt and European suppliers. With this advantage the Ethiopians defeated the Italian armies sent to conquer them, killing or capturing much of the enemy. Ethiopia retained its independence, showing that in a battle with more equalized firepower, the would-be colonized were not such easy prey. 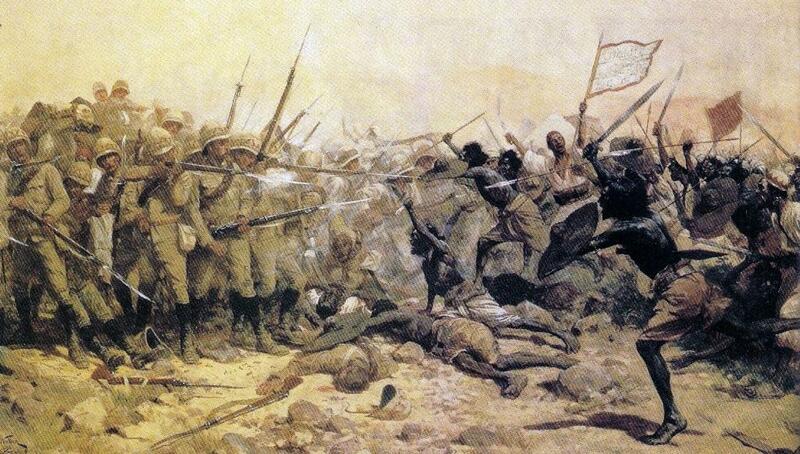 Battle of Adwa, 1896. 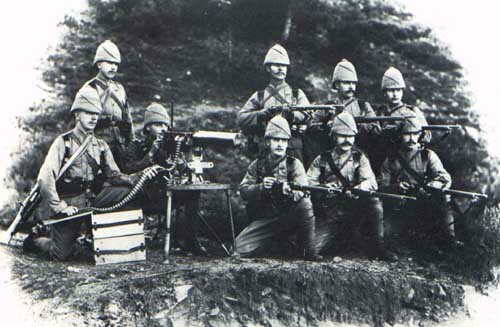 Ethiopian Army armed with modern rifles and Maxim guns. So what happens when we re-imagine a steampunk past where the colonized pick up the gun and turn it against a history of conquest? Does the gun in the hands of the subjugated gain new meaning, as both empowering and liberating? Can it even “subvert” the Imperial Mission? In Michael Moorcock’s proto-steampunk Land Leviathan, much of Africa, Europe and North America have been overrun by the New Ashanti Republic. Through a series of counter-factuals, the Ashantis have managed to develop steam-powered machine guns, dirigibles and other implements of modern warfare, rewriting the history of conquest. Of course it is also led by the so-called “Black Attila” who plans to wreak vengeful genocidal havoc upon whites. * Hmm. Not exactly the liberation I was hoping for. But there are other examples. In Balogun Ojetade’s Moses: The Chronicles of Harriet Tubman, the abolitionist Harriet Tubman packs an arsenal of guns and rifles to use against both slaveholders and the forces of the supernatural. Joseph Bruchac’s Killer of Enemies gives us the gun-toting Lozen, an 16-yr old Apache woman in a futurist post-Apocalyptic steam-powered world who hunts down alien monsters. 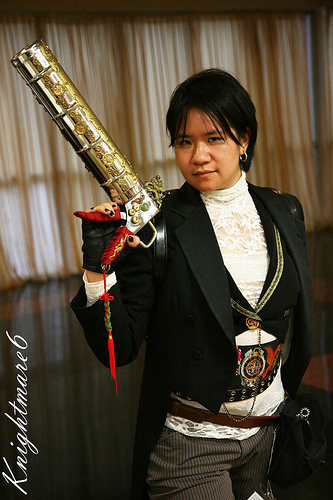 And in cosplay the gun in the hands of steampunks of color, when merged with retro-futurist non-western garb, almost seems to issue a challenge to our history of imperialism and conquest. 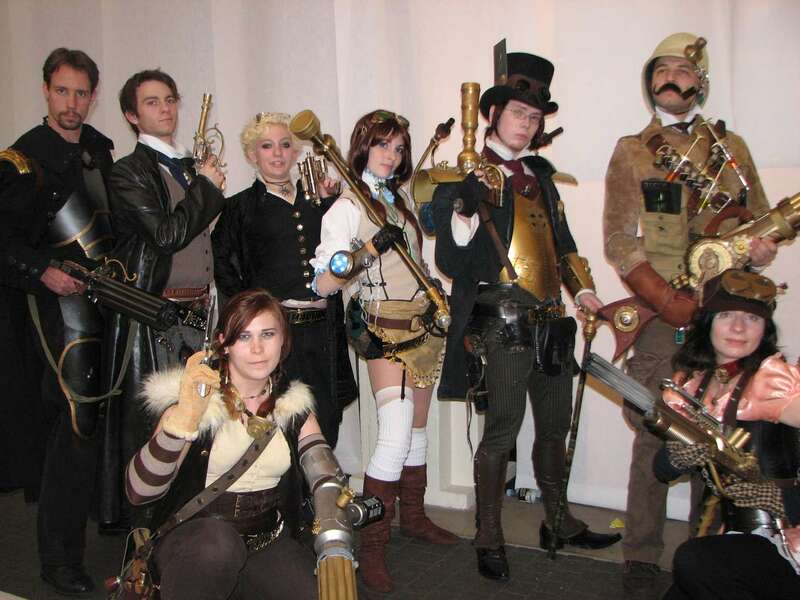 So am I calling for steampunks to abandon the gun? Hardly. I doubt I could if I tried. And believe me, I’m not trying. Steampunks “loves” their guns. Besides, last thing I need is some old white guy in a bowlers hat and dueling cane brandishing an elephant gun, screaming “From my cold dead hands!” No one needs that. Still, it doesn’t hurt to step back and examine elements of the genre we may take for granted, and keep in mind the complicated (even troubling) histories they may draw upon and reflect–intentional or no. Because when you dress up in that sun-helmet and full late 19th century British regalia brandishing a rifle or machine gun, I tend to think of conquest, colonization and racial supremacy. I can’t help but think that, because it’s part of our past–the one you’re trying to emulate. I also think, hey, awesome friggin’ costume! I can hold the two thoughts simultaneously in my head. But I can’t shut one out and only take in the other. History doesn’t afford the privilege. *a correction/update- simonbestwick brought up some worthy points on the improper use of the term “mad man” to describe the Black Attila character in Land Leviathan. I agreed and amended. see comments below for further discussion. This entry was posted in Intellektshul, Personal Musings and tagged Africa, Cosplay, diversity, Guns, Maxim Gun, non-Western, Race, Speculative Fiction, Steampunk by The Disgruntled Haradrim. Bookmark the permalink. I found ‘Land Leviathan’ bothersome and the story somehow didn’t quite go the way I’d expected, which may have been naiveté on my part, neither can I quite put my finger on what I *was* expecting exactly. In any case, this article is excellent food for thought and I will be chewing for some time! Thanks for the read! The idea came to me a month back as I was looking at the prevalence of the gun in the genre (even as decorative) and teaching a segment on colonization. Images of colonizers with rifles and sun helmets kept creeping off the historical pages into cosplay photos, melding in my head. The Maxim gun’s pivotal role really stuck with me. So, thought I’d just bring up the topic as food for thought. Lots to unpack there regarding white (even liberal/radical) perspectives/views of black/PoC liberation struggles: part admiration, part bogeyman. A lot to unpack indeed! I remember, thanks to your quote, that part of my discomfort was the balance being tipped too far towards the other extreme. The white mortified self-awareness really did somewhat drip off the pages. His social anger or wasn’t misplaced, but disproportionate perhaps. If it was a burgeoning awareness that’s understandable in a sense. And as far as my discomfort is concerned, if you’ll allow the digression, I have the same internal reaction to Peter Gabriel’s song ‘The Rhythm of the Heat’…! Great article, although I think it’s something of an oversimplification to describe Hood, the Black Attila in the Land Leviathan, as ‘a mad man’. He’s actually pretty rational, albeit ruthless. The view ultimately given of him is somewhat ambiguous – he’s basically in the right, liberating colonised nations and also liberating the blacks of America – tellingly, Bastable, the narrator, initially deserts his forces because of his ruthlessness towards the whites when he invades the US, but returns to his cause when he witnesses the even uglier brutality of the KKK-style regime in power in America – but is fairly harsh to the whites he overthrows, declaring his intention to ‘punish one generation’ for its forefathers’ crimes, and then gradually move towards a more equal society. Bastable acknowledges a measure of justice to this, but can’t wholly approve – the final impression is that a necessary change has been accomplished, but at the price of many innocents suffering. good points. my overall criticism was the ways in which the character is morphed into a type of despot, whose actions (even if somewhat understandable in this imagined world–whites had reestablished slavery after all) leaves him something of a caricature of black liberation that readily fits into white fears of a vengeful racial apocalypse. but you are quite correct I should not use the term “mad man.” he was quite rational and calculating (Machiavellian even), but not suffering from mental illness–not that I ever recall. the term is distracting and rather insulting to those who indeed deal with such challenges. a bad ableist habit picked up from my literary godfathers that I have to put more effort into breaking. will amend. thanks for the read and advice. Your work is always informative. Thanks for reading! Hope it inspires.